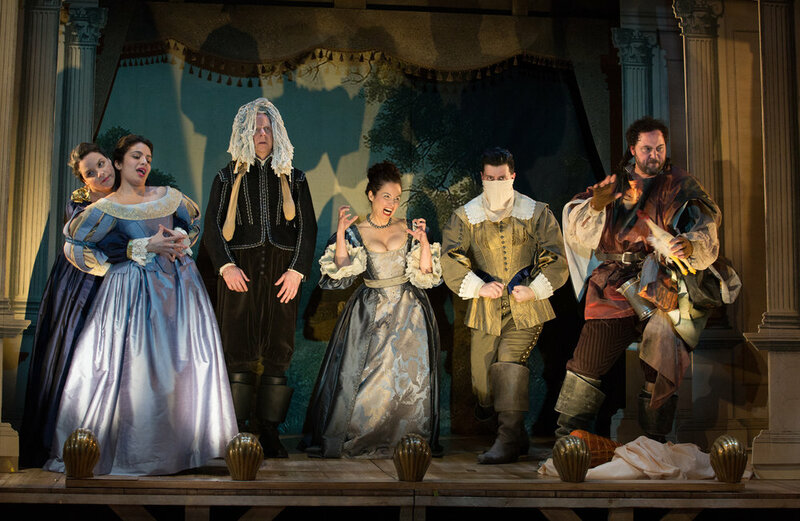 Soulpepper bills La Bete as a ‘modern comedy of classical insanity’. What happens when two diametrically opposed approaches to drama clash with each other especially when one is preferred by a member of the royal French court? We are introduced to the two central characters of the story. Elomire (anagram of the famous French playwright, Moliere) is seriously intent to provide drama in its highest art form, especially for royalty. In contrast, we have Valere (the beast or la bete), a crude actor-writer and street performer who wants to give the audience what they want in their entertainment. Summoned by Princess Conti to mix art for entertainment’s sake, Elomire and Valere agree to combine these two opposing views with a royal performance in Act 2. The ensuing hilarity which follows leads to a profound comment about the state of drama. The look of 1654 France, in the province of Languedoc, is gorgeously captured courtesy of Costume Designer Shannon Lea Doyle and Set Designer Ken MacKenzie. They have ravishingly produced quite the eye candy in their re-creations of colourful, pop up array of layered costumes, and an elegantly dressed playing space of a French theatre from the 1600s. Bonnie Beecher’s warm lighting design accentuates brightly the playing space. Two enormous doors of the French period can be found stage left and stage right. This LA BETE is many things at many times. While watching it, I was reminded of my undergraduate studies of French comedies where absurdity within the plot reigned supreme no matter what until the conclusion. Soulpepper’s production is no different. I had to pay careful attention as I had never seen this production before. Periodically the pace moves at dizzying break neck speed and pace; nevertheless, in the style of French comedy and farce that playwright David Hirson must have intended, the action moves quickly so the audience has no chance to think but simply enjoy. I’m sure director Tanja Jacobs worked with this cast to ensure the humour and comedy didn’t go into the eye rolling, “Oh no, not this again” that can so often occur here. Another challenge concerns the use of iambic pentameter verse throughout the entire script. As a retired high school teacher of English language and literature, I recall the dreaded eye rolling and the incessant groans of high school students, “Sir, did people actually speak like this back in Shakespeare’s day?”. Iambic pentameter verse requires the audience to listen and to hear attentively the dialogue. In Soulpepper’s La Bete, a plethora of information is delivered at a high level of intensity that it might become tiresome to remember the plot. It can be the kiss of death if the verse is mishandled by actors. To future audiences, be mindful otherwise it is easy to get lost. Mercifully, this solid and highly professional ten-member cast company does not mishandle the iambic pentameter verse. They ensure the audience has a great time in watching while moving the plot along. Even if you get lost periodically in the verse, the running around, pratfalls, fart references, sexual undertones and goosing each other will provide laughter. This Soulpepper company is in tip top form and handles the intricate word play and verbal repartee crisply, clearly and deliciously. Sarah Wilson and Gregory Prest are wonderfully cast as the dutiful and serious minded Elomire (French playwright Moliere in anagram) and the lewd Valere. Oliver Dennis as Bejart is a trustworthy confidant and friend to Elomire. As Princess Conti, Rachel Jones sweetly tries to mend the fence between Valere and Elomire. Ms. Jones also shows a stern side as the Princess when she states that, since she pays the bills, Elomire will do as requested. The maid Dorine still puzzles me as she only speaks one word at a time to the others. Periodically that becomes a bit frustrating, but Fiona Sauder makes us forgive this element through some of the physical comic bits she performs. Ghazal Azarbad, Raquel Duffy, Paolo Santalucia, James Smith and Michaela Washburn perform with gusto, fanfare and fervour the second Act play for Princess Conti with energy, enthusiasm and heavy-duty stamina. La Bete originally premiered in New York in 1991 but only ran for 25 performances. In 1992, it opened in London’s West End where it did extremely well and won the Olivier Award for Best New Comedy. For the life of me I can’t figure out why the original New York production did not fare as well as it should, but the European company excelled. I did not know what to expect in seeing La Bete, but I had a good time thanks to this company of ten accomplished performers in the hands of a visionary director who made the story feel contemporary and that worked for me on a warm May evening. La Bete continues at the Young Centre for the Performing Arts, 50 Tank House Lane in Toronto’s Historic Distillery District to June 22, 2018. Visit www.soulpepper.ca for further information and to purchase tickets online. You may also contact (416-866-8666) to purchase tickets. Running time: 2 hours and 15 minutes with one 20-minute intermission. Photo of the La Bete ensemble by Cylla von Tiedemann.